Gasim Ibrahim (61) [or Qasim Ibrahim after re-branding for the campaign] is the candidate for Jumhooree Party. Gasim’s main ally is Adhaalath Party, the most politically active ‘Islamic organisation’ in the country. Candidate Gasim’s defining characteristic, as put forward by him and his campaign team, is that he is the richest man in the country. 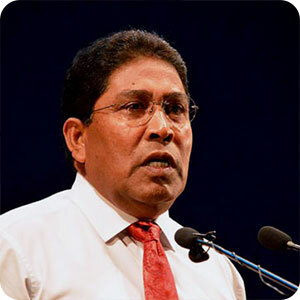 Gasim is the owner of Villa Group, the largest company in the Maldives with 6000 employees. According to Gasim’s Wikipedia page, although ‘his net worth has not been made public’, it is ‘believed to be in access of 500 million dollars’. Gasim’s properties include several luxury tourist resorts, uninhabited islands, and shipping, fisheries, fuel, construction and manufacturing as well as import/export companies. Gasim also runs Villa High School and Villa College, which, although money-making businesses, he also aggressively promotes as evidence of his philanthropy along with a large number of study loans he has provided for many Maldivian students to study abroad. Gasim’s chief selling point is his ‘rags to riches’ biographical narrative. Born to a blind father on the island of Dhiddhoo in the neighbouring Alif Atoll, his mother died when he was 39 days old. Gasim was brought up on Maamigili island by his grandmother and other relatives until he came to Male’ at a young age, ending up as a servant boy in Endherimaage, the unofficial residence of Maumoon Abdul Gayoom. Gasim’s chief patron in the house was Ilyas Ibrahim, Maumoon’s brother-in-law. That Ilyas, a powerful political figure throughout Gayoom’s reign, is now working under Gasim to promote his presidency, is another glorified strand in Gasim’s poor boy made millionaire narrative. Another celebrated one is that Gasim, who did not receive any formal education, was awarded an honorary doctorate from the Open University of Malaysia in December last year. Gasim’s chief pledges are in line with his multimillionaire identity. In addition to laptops and iPads for all children and more materialistic goods to all voters and various constituencies, the Jumhooree Coalition has also pledged that a win for them would ensure everyone in the country will have the opportunity to ‘be a Qasim’. Last Friday Gasim donated a large number of equipment — computers, air-conditions and LCD TVs to schools in Addu City, but has denied it is a bribe intended to influence the elections. What Gasim’s campaign carefully omits from all discussions about his wealth is his enormous debt. While Gasim was the Minister of Finance (2005-2008), the state-owned Bank of Maldives approved loans to Gasim’s Villa Group worth almost US$ 40 million (US$37,601,520) — 32.4 per cent of the bank’s entire capital. The Finance Ministry, which Gasim headed at the time, held a 51 per cent veto over any decision of the Bank of Maldives board, of which he was also a non-executive member. Gasim is also presenting himself to voters as a champion of Islam and has formed an alliance with the ‘Islamic party’, Adhaalath, to ‘defend Islam’. This part of his campaign appears geared towards the not insubstantial segment of the voter population that prefers a manifesto for the afterlife to one for here and now. Given Adhaalath’s goal of making Sharia the only source of law in the Maldives, Gasim’s alliance with the party means that a win for him is likely to bring the country closer to Adhaalath’s dream of the Maldives as an ‘Islamic state’ belonging to a revived global Caliphate. Gasim has four wives, the maximum allowed for a Muslim man, and 12 children, seven boys and five girls. His oldest is studying for a Master’s and the youngest is less than two years old. He also has six grandchildren. Gasim is reputed to have a hot temper and a reputation for not being the politest man in politics. One of his wives has said he is a very ‘caring and sharing’ husband who answers the phone no matter where in the world he is. Another says he is ‘very kindly’, and that he has never spoken to her in anger. Gasim has said that he married four women to increase his chances of having a son. Why should you vote Gasim? Maldivians would know very well that there is no other reason for me to contest these elections except to bring them the development and progress they want. If I were driven only by personal interest or my own business interests, I wouldn’t need to be running for this position. Anybody who gives it serious thought will know that what I am doing is making their development certain. In the same breath, every Maldivian who gives it serious thought will also be certain that I will not touch even a penny from our treasury; that I will not allow room for hatred to spread in this country; that I will get the economy back up and running; that with God’s help I will establish justice to their satisfaction; I will not let our independence and sovereignty be disturbed even the slightest; and that I am ready to spill my blood on this ground in protecting our glorious and sacred religion and independence. 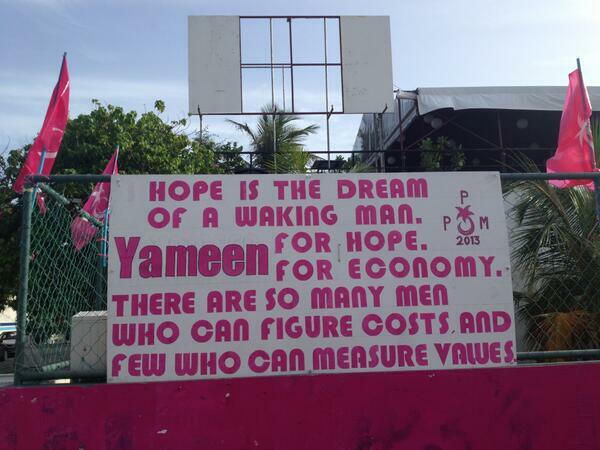 Every person who gives this some thought will know that they must vote for me as President of the Maldives. Mohamed Waheed Hassan Manik (60), is the incumbent President, running as an independent candidate. Waheed took oath on 7 February 2012, a few hours after Mohamed Nasheed resigned under duress. Until then Waheed was Nasheed’s Vice President. 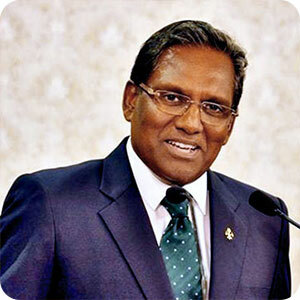 Waheed insists his presidency is legal, a claim legitimised by the Commission of National Inquiry (CoNI) ruling a year ago that the events of 7 February 2012 did not amount to a coup d’état. Waheed’s chief selling point to voters has been a claim to calmness, an ability to remain undisturbed in extreme turbulence. As evidence of this, Waheed has pointed to his two inaugural speeches at the Majlis, delivered amid riotous heckling by MDP MPs and large protests outside. According to his brother Ali Waheed, it is down to Waheed’s infinite patience and unflappability that the streets of Male’ are not completely chaotic as they were in the immediate aftermath of the coup. With a long and illustrious career in the United Nations behind him, Waheed’s campaign also projects him as a man of the world with the kind of international experience that all his rivals lack. Waheed has been described by Hassan Saeed, then his chief political advisor as ‘politically the weakest person in the Maldives‘, and his 18 months as acting president has been disastrous for both him and the country. He has presided over a shocking decrease in freedom of expression and other civil liberties as well as the biggest increase in state-sponsored violence since democratic rule began. Waheed’s government has entirely failed to take any steps towards crucial judicial reform, has been dogged by massive economic problems, and has damaged foreign investor confidence with a range of bad decisions, especially the decision to void GMR’s airport development contract. Waheed insists none of this has anything to do with him and maintains that he has support of ‘the silent majority’ which he estimates to be about 90 percent of the population. Waheed makes a mean lamb/beef curry, shares domestic chores with his wife Ilham Hussein, loves cycling and listens to Ghazals. He has three grown-up children, two of whom are as involved in his political life as his wife. Until recently, his youngest, a son, was known as Jeffrey but is now referred to as Salim, perhaps to appease the radical Islamists who insist on Arabic names for children as proof of the parents’ Islamic beliefs. His wife Ilham, who is also his first girlfriend, has said what she admires most about him is his morals and good manners. Why should people vote for Waheed? I believe that today the Maldivian people want a leader who will take the nation forward calm and steady. People who can bring the necessary development and reforms as smoothly as possible. I have shown this to the best of my ability in recent days. This is a difficult time. This is an unusual time in Maldivian history. It is a time of exceptional change, a time which requires that we go forward with some amount of maturity, calm and steadiness. It requires development of the whole country without personalising the difficulties, by looking at the big picture. We have to find a way to continue with the democratic work that has already been started. I believe that our brothers and sisters will carefully look at all candidates. When they do, I believe that I will receive a lot of support. Yameen Abdul Gayoom (54) [also known as Abdulla Yameen] is PPM’s [Progressive Party of Maldives] candidate and brother of Maumoon Abdul Gayoom who ruled Maldives from 1978-2008. The defining characteristic of Yameen’s candidacy is, in fact, this family relationship—a vote for Yameen, the electorate is told on a daily basis, is a vote for Gayoom; electing Yameen would be a re-election of Gayoom by proxy. Yameen’s chief selling point is that he is an economist and as such someone who can manage the country’s bankrupted finances better than any other candidate. 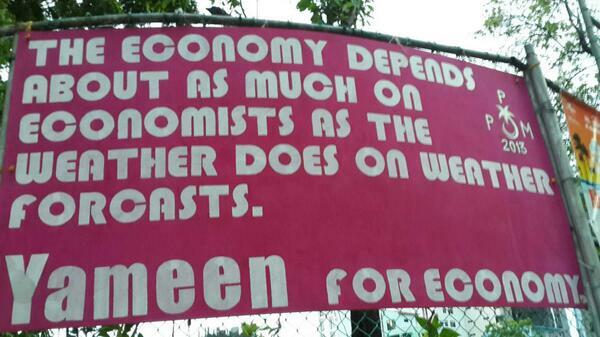 Giant billboards appeared all over Male’ in the early days of the PPM campaign, some with quotations from famous world economists, as evidence of Yameen’s economic competency. Yameen has also promised to concentrate on making things better for the country’s youth, the most troubled and troublesome segment of the Maldivian population. Several accusations of corruption, including alleged involvement in an international money laundering racket worth US$800 million with ties to the Burmese junta have been levelled against Yameen. He denies the allegation and all others, describing them as ‘baseless and unfounded‘. 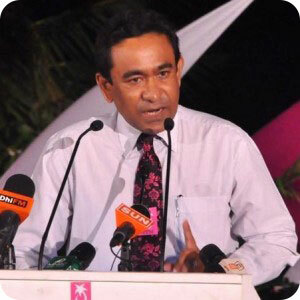 Yameen is known for his tendency to sue for libel against anyone who makes or repeats such accusations, sometimes claiming millions in damages purportedly for no other reason than to ‘vindicate his good name.’ Apart from the promise to bring back the policies and characteristics of brother Thuththonbe’s [Gayoom’s] rule, one of Yameen’s main pledges to voters has been his promise the plan to restart his earlier attempts to explore for oil in the Maldives. Most of Yameen and PPM’s campaign has otherwise concentrated on criticising rival Mohamed Nasheed, the Maldivian Democratic Party candidate and others. Yameen has a hard time smiling, a fact which his campaign has sought hard to remedy with several friends appearing on MNBC One’s RiyaaC programme with Yameen to insist on how much fun he really, really is. He is, the PPM campaign has insisted, ‘a seriously funny man’, and it is a mistake to view his normal ‘reserve’ as arrogance. Yameen has three children, oa six-year-old boy and two grown-up children. His wife Fathimath Ibrahim is an active member of his campaign, although both his older children he says, absolutely hates the fact that he is in politics. When he appeared on the RiyaaC programme, he was shown relaxing at home with a book which, on close inspection, appears to be Heart Work by Chan Chin Bock [Publisher: Singapore: Economic Development Board] – more evidence of his competency as an economist. Why should you vote Yameen? The only viable option for any Maldivian who wants to make their lives better is to vote for me. [Why?] Because the biggest challenges we currently face are in the economic sector—problems in this area are permeating all others. Why is the health sector not developing as it should? Why cannot we add a new classroom to a school? Why aren’t there more doctors, more foreign doctors? Why are we short of IV fluid? These are all budget, money, dollars and sense, Rufiyaa, Laari, aren’t they? So, to find out how to earn Rufiyaa Laari, to understand how to spend Rufiyaa Laari with the least amount of waste and knowing how to draw the political map is the only way to draw the map and get there. Is it not? That’s why I have said a person who comes to the leadership will come with the aim to do something, not to continue business as usual. That’s why I want to say to all Maldivians: if you want to seriously change things for the better, there’s no need to look at any other candidate in my opinion, okay? Mohamed Nasheed (46) is the candidate for Maldivian Democratic Party (MDP) and the only democratically elected president in Maldivian history. He was ousted on 7 February in the coup that was ruled ‘not a coup’ by the Commission of National Inquiry (CoNI). Nasheed’s chief selling point is his long history of fighting for democracy in the Maldives and his pledge to restore it if elected again. Nasheed’s two and half years in government (November 2008- February 2012) was controversial — people either loved him or hated him. Few were indifferent. The Nasheed administration introduced free healthcare, a basic pensions scheme for the elderly, and a desperately needed transport system that made travel between the islands scattered across 90,000 square kilometres of Indian Ocean easier than ever before. Freedom of expression and other civil liberties flourished to unprecedented levels during his presidency. A large share of Nasheed’s time in government, however, was spent fighting the always present threat of an authoritarian reversal, the ‘dregs of dictatorship’ that remained within every branch of government. The opposition majority in parliament blocked several key plans of the administration and opposed judicial reform at every turn, vehemently obstructed Nasheed’s push for taxing the rich, making the executive’s job as difficult as possible in the new democracy. Throughout his years in power, his administration was also dogged by accusations of nepotism, over-indulgence, and most damagingly, of being ‘irreligious’ [Laa Dheene] and anti-Islamic. Despite the latter, it was also during Nasheed’s presidency that Maldivian religious radicals, liberated by Nasheed’s commitment to freedom of expression, most widely disseminated their hate-filled ideologies ultimately contributing to his downfall. As a presidential candidate, Nasheed still rouses strong emotions. Tens of thousands—men and women of all ages—clearly adore him. Detractors hate him, refusing to believe he resigned under duress and accusing him of concocting a tall tale about being forced to resign. In their version of the truth, he left the position unable to govern or in a moment of weakness. Despite the allegations, all his opponents acknowledge that he is their strongest rival. In fact, all of them have said he is their only rival. 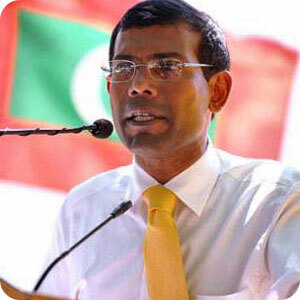 Nasheed is a history enthusiast who has authored two books. A former journalist and an avid reader, he has said his true passion is writing. He loves animals and kept a whole cage full of birds until he was jailed himself. On returning from prison, he freed them all. He loves spending time with his two daughters and, as a committed weekend-cleaner at home, has said if he loses the election his teenage daughter has suggested they start a domestic cleaning company together. His wife of nineteen years, Laila, has said what she loves most about Nasheed is his great sense of humour. I believe the Maldivian people really wanted to ask ‘why’, and to do something by themselves to find an answer to the ‘why’. They wanted to vote, and to establish a leadership from the results of that vote. They wanted to have more than one person to vote for and to have a competitive political environment . People are realising that it is we who have tried to establish competitive politics in this country and I think they accept what we have done in this regard. People also appreciate what we were able to do in our two years. Our track record in government is good. We did not arrest and torture a single person. We did not seize anyone’s property unlawfully. People really wanted to be free from torture, to be safe from inhumane violence. Our track record on that is impeccable. I also feel that people accept the policies we propose for the future. I believe this year’s election results has almost been decided already. The re-registration of voters casting their ballot paper in places other than their home islands has shown clearly that we will win in one round. God willing, we will win in one round.